Hello Dealsnloot Readers,Eureka Forbes Friends As We All Are Getting News For The Scarcity Of Water Or The Scarcity Of Water Which Are Available To Drink This Types Of Problem Facing Day By Day.Pure Water Is one Of The Most Precious Need Of Our Human Beings Specially Now A Days Its Become Compulsory To Sustain Our Life In This Polluted Environment.They requirement Needs A Good water Purifier .Today Yureka Forbes Came Up with A Awesome Promotional Offer Of Free Demo Of Dr. Aquaguard Water Purifier.Yes , You Can Get A Free Home Demo Of This Awesome Water Purifier Dr. Aquaguard. So Hurry !! Grab This Free & Exclusive Loot.Check Your Home Water This Diwali. 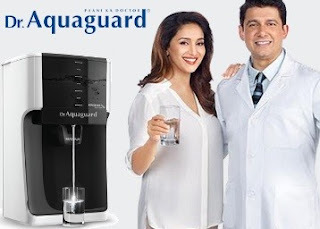 Note :- THIS IS ONLY A FREE DEMO OF DR. AQUAGUARD WATER PURIFIERS .THERE IS NO NEED OF BUYING IT IF YOU FOUND INTERESTING THAN ONLY YOU BUY IT.BUT YOU MUST DEMO AS DRINKING PURE WATER IS ESSENTIAL PART OF OUR LIFE.IT Free FREE FREE. 4. After that click on SUBMIT "Get Home Demo"
6. Soon a Dr. Aquaguard executive will give you a free Home Demo also they conduct a water check at your home for free.